Carpe Noctem is a celebration of the flower that blooms for no-one. 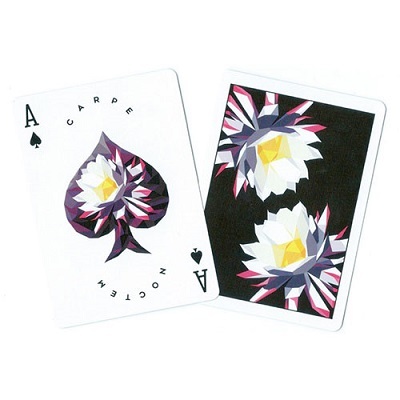 Inspired by 'The Night Blooming Cereus' - one of the strangest and most beautiful plants of the desert - the Carpe Noctem deck unveils it's true beauty only after dark. Once per year, on a warm midsummers'night, this unassuming flower blossoms with exquisite beauty and then wilts away with the morning sun. We captured that narrative in the cards. Dipped in deep black ink, the bold back-design breaks through with force. Cocooned with pearl white borders. The box is subtle, but embossed, to emphasise 'The Queen Of The Night' forcing itself to be noticed. These cards are a statement, for those who choose deafening silence as their soundtrack to success.